Have you looked at the airport security line and wished for a FastPass? Well sir, you just may be suffering from Disney-fication, the topic of this week’s show. Also this week, we’re glad to bring you a ride through of the Hershey’s Chocolate World Chocolate Tour, recorded the day after MagicMeets. We had an alarming amount of fun on that attraction…so much so, that we wished we could take you all along with us! It’s also only fair to warn you: The attraction’s main theme is a disturbingly catchy ear worm, which you’re likely to find yourself humming, whether you like it or not. Sort of like, oh, this little boat ride I’ve been on a few times, featuring tiny little children with unfortunate joint problems, doomed to sing the same song over and over and over again. I also must say, Lisa might think I am a bit mentally unstable. 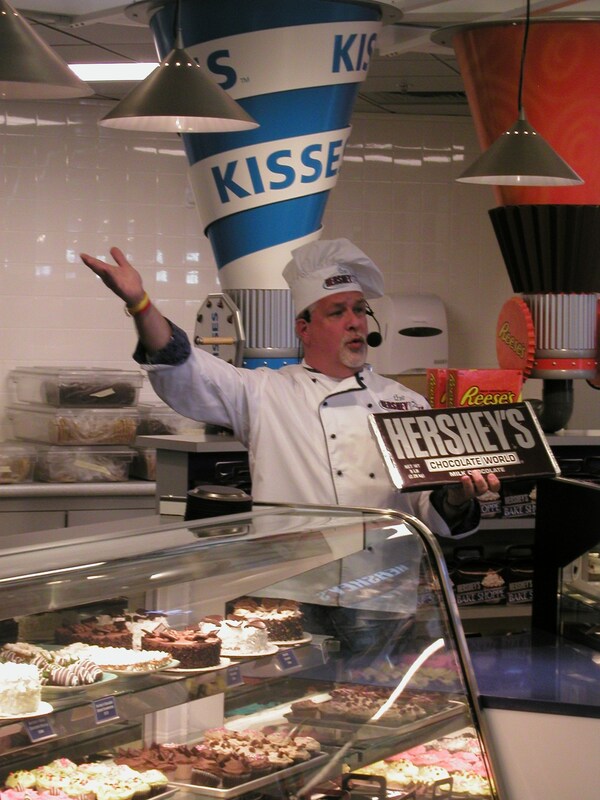 This is of course for many reasons, but not the least of them being the fact that I swear the last time I was at Hershey’s Chocolate World, there was a singing chef making custom cupcakes. So hey, Lisa, here’s that picture again, just to reassure you I’m still (perhaps tenuously) still grasping reality, at least by some measure of that word. UPDATE: check out the visuals for the ride through here – www.youtube.com/northernmousepodcast! Courtesy of the Northern Mouse Podcast! Thanks, Carlos! This entry was posted in attraction ride-throughs, Disney, Disney Parks, Disney podcasts, Hershey's Chocolate World, podcast by Jennifer. Bookmark the permalink. I did get a picture of the crates (though not a good one — we were in the far line), I just haven’t done anything with it yet. Maybe I’ll get it up on my blog soon. Thanks for the ride-thru. That song is about as addictive as Small World. I’ll be walking around singing “It’s the Milk Chocolate” all day now. And by the way, Mrs. Craig’s name is Kristin. he – sorry about that kristin! i knew it was that after i had a chance to go back through all my notes etc… and kristin is a nurse too! woot! and quite the runner apparently as well – people if you don’t know check out: http://www.runningtodisney.com! Another great show! I’m always finding hidden Mickeys in “real life”. I see one almost daily on the Office Depot (or is it Max) delivery truck. It always makes me think copyright violation. My worst offense was Star Wars related – I know shocking a Disney and Star Wars fan -bet that Venn diagram is pretty close to being one circle. Anyway, I was looking at the sky one night when a plane flew by pretty high up and I thought ‘i wonder if that’s an Xwing’. That’s pretty bad. Thanks for bringing up Cupcake Man! I used to work in the building that the Chicago Hershey’s store is in. Whenever I was hatin’ on my job I could go down and watch Cupcake Man. I often wondered did he graduate from Le Cordon Bleu or Julliard? Or did he just lose a bet? It was a little creepy in that fascinating pass the popcorn kind of way. I’m alright with PDA’s at the park and even work calls (although I tell my boss & employees to consider me dead to them when I’m at Disney) but one day my ex made a point of showing me where she & her stoner friends used to smoke pot on Tom Sawyer island at DL. That was over the line. I’m not against smokey treats in general, but not at a Disney Park!!! Oh and the most effective ear worm removal tool I have found is the song Car Wash, your welcome. Everybody sing it with me! Car Wash, working at the Car Wash yeah! As I was walking down the hall at work today, I realized that I’ve successfully Disney-fied the company where I work! In addition to all the personal Disney items I have on my desk, I was able to add the “Four Parks, One World” Disney music CD into our rotation of background music that plays all day on the overhead speakers throughout our office. So, periodically, I get to hear the music from Main Street, Small World, American Adventure and even Haunted Mansion! It adds magic to my day! Dear Cats that are so full of chaos and enchantment. I’m sorry life has been so busy and chaotic. I’m such a bad follower of the TDC Nation. I haven’t posted on the TDC site in weeks. Thanks for the comments DisneySchoe! Sadly, I do have to say in my own defense that the main reason for my disinterest in Hershey Park is that I’ve currently got a medical situation that makes most roller coasters inadvisable, and I’ve always had the impression that extreme coasters are Hershey Park’s main appeal. But it does sound like fun from a themeing perspective as well. But do remember that Hersheypark is also part waterpark and part zoo. At Hersheypark, only 5 out of 11 rollercoasters are pretty intense, the rest are pretty mild. Ah, good point about the Zoo….I always forget that!